As efforts to reduce radiation dose gain momentum, a change in thinking within the radiology profession is necessary. Particularly, acceptance must be gained in order to convince radiologists that modifying the protocols they have used for years will still yield acceptable images. A significant benefit is coming from the growing range of advancements on the CT scanner to improve image quality at lower doses and to reconstruct more data from scans that use less radiation. Some targets remain a challenge, but with faster acquisition times, many of the traditional limitations are being overcome. When CT protocols are set across an institution, they must be set respective of each unique scanner. The task of achieving consensus across an entire group of radiologists can seem daunting, but the end result is to achieve diagnostic quality images with the most responsible use of radiation. Additionally, protocols must be adjusted based on scanner type. At the University of Chicago Medical Center, scanners are used from 16 slices through 256 slices. The “quality” of any image is subject to a wide range of definitions, and even in CT where there are strictly applied measures of quality, as defined by the ACR Panel for Accreditation, there is still a subjective analysis made by radiologists as to what constitutes a high-quality image. CT images are generally judged on the presence of noise, the slice thickness (e.g., the Z-axis resolution), and the high- and low-contrast resolution. In cardiac imaging, the measure of image quality revolves around contrast density (the maximum density of contrast opacification in the coronary arteries), and it is measured in Hounsfield units (HU), generally no less than 300 HU in the proximal coronaries. Cardiac imaging also is susceptible to motion artifact and the entire study is reviewed alongside the electrocardiogram (ECG). “At the end of the day, the measure of image quality is determined by the noise in a study, and each physician sets his or her own barometer for an acceptable study,” said Chip Truwit, MD, Professor and Chief of Radiology, Hennepin County Medical Center and Hennepin Faculty Associates, Minneapolis, MN. Part of the ability to optimize any type of medical imaging is to choose the right modality for the right patient. 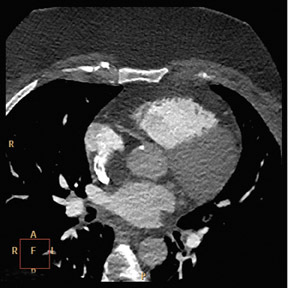 For instance, a patient with a very high or irregular heart rate who very urgently needs an assessment of coronary anatomy might not be the best candidate for CT and instead should potentially be imaged with traditional cardiac catheterization. In younger patients, magnetic resonance imaging (MRI) or ultrasound may be better imaging choices for an initial assessment. It is necessary to involve the referring physicians and ensure that they are educated about the role of each medical imaging tool. “At the Cleveland Clinic, we employ a multimodality imaging model where a group of physicians, who are collectively knowledgeable about all imaging modalities and their limitations and advantages, direct patients to the optimal imaging modality in the right clinic setting,” said Paul Schoenhagen, MD, Staff Physician, Department of Diagnostic Radiology and Cardiovascular Medicine, Cleveland Clinic, Cleveland, OH. In cardiovascular work, the challenge between lowering dose and increasing quality is amplified because the imaging targets are small structures that move rapidly, according to Harvey S. Hecht, MD, FACC, Director of Cardiovascular Computed Tomography, Lenox Hill Heart and Vascular Institute of New York, New York, NY. Ensure the patient has an adequate heart rate — the lower the better. For retrospective imaging, obtain as many phases as possible and spend the appropriate amount of time to ensure that every phase is covered sufficiently to obtain excellent images from each of the coronary arteries. For step-and-shoot with prospective imaging, the choices are more limited. For instance, if a study is acquired of 75% of a cardiac phase, there is an option to reconstruct the phases at either 76% to 77%, or 73% to 74%, giving the same dose reduction from the prospective acquisition, yet providing more leeway in interpretation. 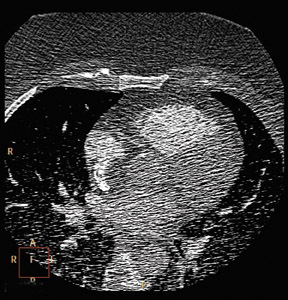 When imaging pregnant patients through the thorax for suspicion of pulmonary embolism, clinicians must be mindful of both the patient and the fetus. Part of the appeal of CT imaging is that patient selection is not as restrictive as with MRI, that it provides higher anatomical detail than ultrasound, and produces excellent spatial and temporal resolution. While implantable devices may rule a patient out of MRI entirely, those patients could potentially be imaged on CT, although there had traditionally been challenges with the attenuation artifact. “Metal implants are a big problem in the revascularized heart, where patients may have implants or multiple surgical clips,” said Dr. Smuclovisky. In these cases, studies that employ iDose4 can be performed with less radiation and can reduce the amount of artifact from the implantable devices, thus improving image quality. The iDose4 approach is beneficial when imaging stents, however, surgical clips on bypass grafts can still lead to uninterpretable segments. The same issues occur when imaging patients with spinal implants and other fixation devices. The newly released Ingenuity CT addresses these clinical scenarios and complements the benefits provided by iDose4 with a novel metal artifact reduction algorithm incorporated into the reconstruction subsystem. While there are technological improvements that can contribute to reduced radiation dose, one of the major advancements will be the effects of better ordering habits. These habits will be a result of better education for referring physicians. Additionally, increased utilization of the electronic medical record — with the ability to track a patient’s prior history of CT examinations — will provide a more informed picture to referring physicians. Finally, the industry is actively developing automated decision support tools that will help referring physicians understand the alternative imaging options that are available. Using these types of automated and electronic tools could help reduce the real problem that plagues CT: finding a way to increase the data about a patient’s procedure history so as to avoid excessive repeat scans. High Quality Imaging with Reduced Dose. Appl Radiol.